Part of the fun of the Blogenning is that once a week someone chooses a topic for you. Some weeks it’s incredibly easy and some weeks you have nothing to say about that subject and just have to roll with it. This week Ian has decided we’re talking about National Novel Writing Month. I’ll let you decide where this one falls. Well, it’s October now. That means that pumpkins are back in vogue. They’ll be getting festively dressed up for a bit, and then smashed in to all sorts of treats. It also means that a crazy few of us are counting down the days to the delirious daze that is National Novel Writing Month (NaNoWriMo from here on out). The event lasts the entire month. We start at midnight on November 1st and do not stop until our goal is met or 11:59pm on November 30th rolls around. The goal of this event is simple: write a novel in a month. More specifically, for the NaNos (or Wrimos, depending on the moment they’re being referenced), the goal is to produce a work of fiction at least 50,000 words in length (the point at which it becomes classified as a novel). Some expand on this, setting loftier goals or actually trying to finish the plot of the book in at least 50,000 words. In the end, you “win” when you pass 50k. The ideas is to pound out a first draft. We’re striving for quantity (with hopefully some quality). As always, it’s easier to fix a broken scene than to fill a blank page. All in all, this works out to writing about 1667 words a day for a month. This can take anywhere from about 30 minutes to 20 hours depending on the day of the month and how much you loathe your novel and yourself. John looked down at the plate, festooned as it was with turkey, baked beans, mashed potatoes (with gravy of course), cranberry sauce, carrots, peas, corn, stuffing, and corn bread, and sighed inwardly. Sure the food was delicious, but didn’t his family know that if he ever wanted to make a name for himself as a published author he should be slaving away at his typewriter instead of shoveling fatty foods down his gullet. Then he thought of the food induced stupor that was heading in his direction. Today was sure to be a waste. Not a word would be written. His smiling parents were just happy to see him emerge from his room for longer than in took to cobble together a sandwich, use the rest room, or occasionally shower (and indulgence he allowed himself as much for its therapeutic qualities of calming the mind, as for his concern at not driving his parents from the house with his creative stench). It would be a long day, and tomorrow would be even longer as he tried to make up lost ground. He actually considered returning to his work as an insurance salesman for a moment, before wallowing in complete despair, shoving a piece of moist turkey breast in his mouth, and resigning himself to his lot. So what will I be writing about? I have no effing clue. I did just finish reading Fuzzy Nation by John Scalzi (his take on the earlier Little Fuzzy by H. Beam Piper). This was absolutely delightful. I can only hope to channel a little of John Scalzi‘s clear and compelling writing style, not to mention his thoughtful attention to relevant detail. I am also waiting for my copy of Terry Pratchett’s latest Discworld novel, Snuff, to wing its way to me. As soon as it arrives I will probably devour it in a few days. This should add some wit and whimsy to my NaNo abomination. All that’s left really is to think of a loose plot idea that I don’t really care about and wait for November 1st to hit so I can start writing with as much abandon as I can muster while slowly coming to despise myself as the hack writer I am. I swear this is a lot of fun, guys. You should come do it with me! Wrimos, especially Boston area Wrimos, are awesome. Just look at (most of) the blogenning members for proof! P.S. 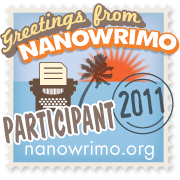 : It’s quite fortuitous that NaNoWriMo coincides with No-shave November. Who has time to shave when there’s a novel to be written? P.P.S: This post has worked out, according to WordPress, to be about 850 words in length, which is slightly over half of the daily word count for NaNoWriMo. When viewed this way, I find NaNo seems far less daunting than it would otherwise. Here’s a thought! Make no plot plans until the Meet and Greet. Then, when asked to tell the group what your novel is about, declaim something suitably dramatic and/or insane. Finally, freak out at realizing what you’ll be writing about.